Sincere condolences to Tomas’ family and friends. Rest in peace, dear Tomas. 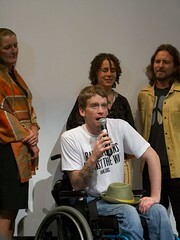 Iraq War veteran and anti-war activist Tomas Young has died at the age of 34. One of the first to openly oppose the US-led war after being paralyzed while deployed, Young spoke to many, including RT, about why we should demand more of our leaders. RT’s Manila Chan has the interview. This entry was posted in All Posts News Politics and-or Videos, Anti-war, Dandelion Salad Videos, Health Care, Iraq, Politics, Soldiers - Troops, Veterans and tagged Before You Enlist, Body of War, Must-See Video or Videos, Phil Donahue, Tomas Young. Bookmark the permalink. “Body of War” is a brilliant documentary that comes about as close to masterpiece as any other film about war in recent years. As moving as “Deerhunter”, but perhaps more powerful because it’s all about real events. Must viewing for all Americans. Thanks. I’m so glad that they made it available via video; hope many more people watch it. Thanks for your well-stated review, Jerry. Thanks Lo. It took me a while to summon the endurance to watch this, superb work. Thanks for watching it, David. It’s an excellent film; one that all potential recruits should have to watch before signing the dotted line to join up.